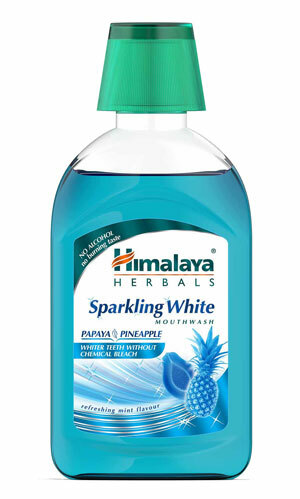 Himalaya Sparkling White Mouthwash is a unique herbal formulation based on Plant Enzyme Technology from Papaya and Pineapple that gently removes surface stains in two weeks, making your teeth naturally white and sparkling. This no-chemical bleach formula kills 99.9% of bacteria and provides up to 12 hours of protection from germs. Himalaya Sparkling White Mouthwash contains no alcohol and does not cause a burning sensation post use. It is fluoride free and clinically tested. Fill cap with 15 ml of mouthwash, rinse thoroughly and expel after 30 seconds. Do not swallow. For best results, use after Himalaya Sparkling White Herbal Toothpaste twice daily.